Use the web version of QuoteWerks to create, edit, and view your quotes from anywhere using a web browser. QuoteWerks Web is accessed by your favorite web browser and includes many of the great features in QuoteWerks Desktop, including a full support with QuoteValet and Etilize. Users will also have access to their existing documents, products and services, layouts, and more! QuoteWerks Web requires minimal setup and has affordable licensing! 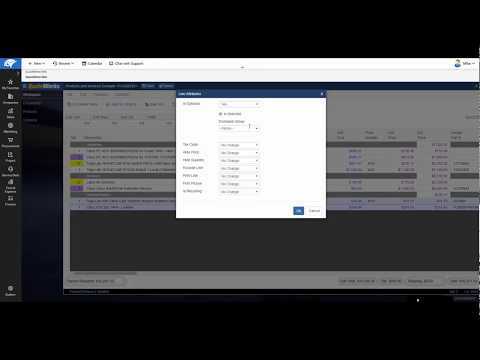 QuoteWerks Web has a full CRM integration with ConnectWise Manage and Autotask. Watch the QuoteWerks Web for ConnectWise Manage users video and the QuoteWerks Web for Autotask users video. Next up for full integrations are salesforce.com, and Microsoft Dynamics CRM (MS CRM). Currently you can search for and retrieve contact information from Autotask, ConnectWise Manage, Google Contacts, Microsoft Dynamics CRM, salesforce.com, and SugarCRM contacts. 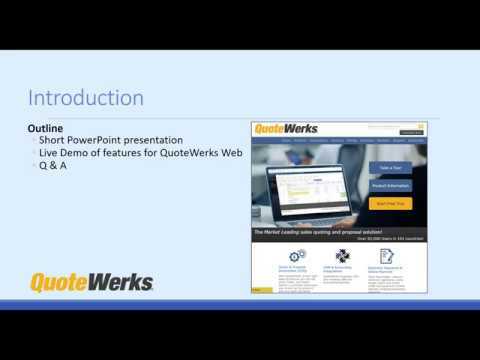 How does QuoteWerks Web licensing work? QuoteWerks Web is an add-on to the QuoteWerks Desktop product that gets you access to your QuoteWerks through a web browser. If you have purchased real-time licenses, Etilize subscriptions, and/or QuoteValet subscriptions for QuoteWerks Desktop, these features will be accessible in QuoteWerks Web. How many QuoteWerks Web Licenses do I need? You only need as many QuoteWerks Web licenses as users that will be using QuoteWerks Web at the same time. You will need at least one QuoteWerks Desktop License for each QuoteWerks Web License. Practical Example: If you have a QuoteWerks Desktop 5-user Corporate Edition license and 2 QuoteWerks Web licenses, you can have a maximum of 2 people using the web interface of QuoteWerks and 3 people using QuoteWerks Desktop. So in short, whether you are using QuoteWerks through the web or the desktop, you use a Desktop license. The number of users that can be in QuoteWerks Web at the same time is limited by the number of Web licenses that you have. The Microsoft SQL Server must be accessible by QuoteWerks Web, either on-premise, hosted by third party provider (like Microsoft Azure or Amazon RDS), or you can sign up for the QuoteWerks Database Hosting Service. If your QuoteWerks Desktop Database is already on Microsoft SQL, QuoteWerks Web can connect to your existing environment enabling you to instantly access all of your existing quotes (no migration needed). QuoteWerks Web is a hybrid cloud solution - we host the web app and you or a database provider hosts your data. You can host your SQL database on your network, Amazon RDS, Microsoft Azure, or with us via our QuoteWerks Database Hosting Service. You can open any document in the QuoteWerks database. Security restrictions are applied, so you can only open quotes that you have access to. If you only have read-only access to a quote then you will only be able to open it in read-only mode. You can make changes to the quote information on the tabs and the document items and save those changes. All security restrictions are obeyed, so if you do not have the access right to modify any particular field or cell it will be honored. The links tab is viewable. All drop down lists like DocStatus, SalesRep, PreparedBy, etc are populated. You can add new line items manually to the quote. You can insert new line items manually into the quote. You can even insert them inside existing groups. You can search for and retrieve contact information from the built-in QuoteWerks contact database. The full ConnectWise integration is supported including writing Sales Opportunities, Tickets, and more. 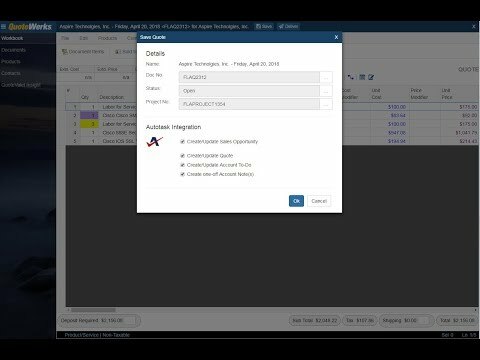 The full Autotask integration is supported including writing Sales Opportunities, Quotes, and more. You can search for, display and use products from native product databases, including from folders. You can To be able to search Etilize/content server/real-time P&A for distributor products. You can use all your same fpc layout files and word documents to generate output in QuoteWerks Web. You can see and refresh leasing information on the Sale Info tab. Label customizations on the quote tabs are applied. Label customizations for all the fields on the main quote tabs are applied. Column heading customizations on the DocumentItems tab are applied. All line item coloring and styling and formatting is applied. To request more information about QuoteWerks Web, please email sales@itmicroscope.com.